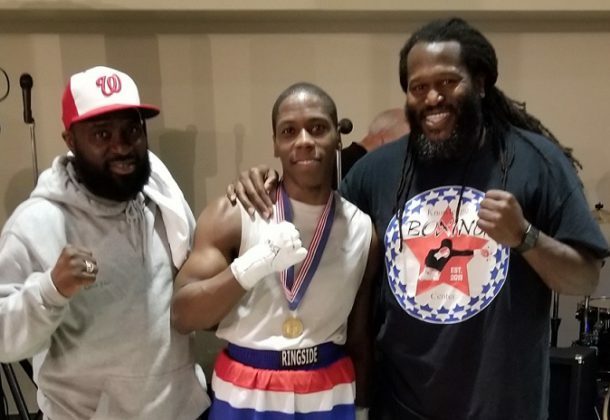 Great Mills resident Devante “Quiet Storm” Alexander of Great Mills won the local 2019 Washington Golden Gloves Championship in the 141-pound weight class on April 6. The DC/Maryland/Delaware championship was held at Rosecroft Racetrack in Fort Washington. Alexander, who trains at the Knowledge Boxing Center in Lexington Park, won his very competitive bout via third-round stoppage against Tre’Von Wells of Prince George’s County. Alexander said he trained for multiple hours each day at Knowledge Boxing Center, along with keeping a steady running schedule. Hinmon praised his young charge. “If I had to go to war, Devante Alexander is one of the first warriors I would choose. He’s just a solid human being who we can always depend on to give his all. He consistently steps up to the many challenges that boxing and life has thrown his way. He’s a real stand-up guy,” Hinmon said. Alexander said he felt total satisfaction after the referee stopped the match at the beginning of the third round. Alexander and Almaraz will compete in the 2019 Regional Championship on April 27 at Rosecroft. To learn more about Knowledge Boxing Center, call 301-481-2978 or click on the Knowledge Boxing Center link provided above. The organization is at 21310 Great Mills Road, Lexington Park, MD 20653.